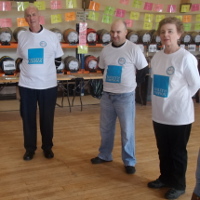 Horsforth Beer and Cider Festival is organised by St Margaret’s Church. The festival started in 2009, initially to raise funds towards the building of the Parish Centre. Since then the money has helped St Margaret’s carry out major programmes of work, such as replacing the heating system and carrying out extensive repairs to the roof and tower. 2015 was our seventh year. 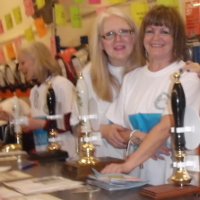 Nine months planning culminates in a beer festival lasting two days and the 2015 festival proved to be our busiest one yet. We are told that our festival has a warm, friendly atmosphere and our reputation has grown over the years. Many people travel some distance to attend - this year someone made the trip from Southampton. The hall capacity was reached early on Friday evening with customers then waiting up to an hour for others to leave so that they could get in. On Saturday we continued to admit people well into the evening as there was still a good selection of beer to choose from. We received many compliments on the choice of beers, most of which were new to the festival and the area. This year’s selection, our largest ever, of 69 beers and 26 ciders, included the first commercially available beer from Horsforth Brewery, a new nano brewery. Its Lost Dog IPA became the quickest beer ever to sell out, in just 6 hours 5 minutes. 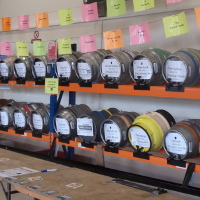 In total we sold 601 gallons of beer (over 9,600 glasses) and 136 gallons of cider (over 2,100 glasses) with only 19 gallons left to pour away on Sunday morning when the clearing up began. The café stayed open on each day well past the planned closing time, such was the demand for food, and we only closed when the food ran out. In addition to the home-made “specials” made by members of St Margaret’s, we roasted beef and pork joints and fried bacon for hot sandwiches, and sold 100 portions of pie and peas each day, with the champion pork pies freshly baked by Wilson’s Butchers each morning. The 2015 festival raised a record £16,965.78 which was shared with two local charities, St Margaret’s Scouts and Guides, who faced a hefty bill to repair the water supply at their headquarters building, and Horsforth Live At Home Scheme, which provides a variety of services and activities for older people in Horsforth, supporting those who live in their own home. 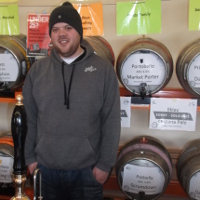 Festival goers voted for the Beer of the Festival and 2015 saw a return to form for the North Riding Brew Pub, which previously won in 2012 and 2013. For the first time ever festival goers also voted for the cider of festival. 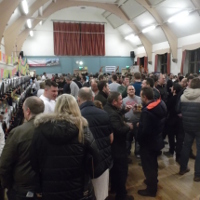 2015 was the last Horsforth Beer and Cider Festival in its present form, due to the planned sale of the venue, St Margaret’s Hall. It proved to be an excellent community event, with a super selection of beer and cider, lovely food, record numbers of people through the door, no trouble, and happy sponsors and customers. Even the volunteers enjoyed it, despite their aching muscles. We are grateful to all those who have supported the event over the past seven years. Thanks to all those who helped in any way to make the 2015 festival happen. A pleasant bitter beer with a strong roast malt flavour . Pale bitter with citrus aroma and hoppy citrus finish. A traditional bitter brewed with Maris Otter, crystal and chocolate malts blended with choice hops. Copper coloured fruity summer ale packed full of flavour. Blackberry, strawberry and floral rose notes in perfect balance with just the right amount of malt character. An amber bitter using Propino and Crystal malts with a blend of Progress and WGV hops. Golden straw coloured bitter using best quality pale ale malt with an addition of lager malt and black, crystal and wheat malts, giving a complex biscuity flavour. The bitterness coming from a selection of choice English hops. A rich strong dark mild beer. A pale and hoppy session beer. An easy drinking session bitter. Light brown, moderately bitter but with good hop flavours, ending with a hint of tangerine. A very quaffable ale brings together the finest French and German hops. It has strong floral flavours with hints of lemongrass and Earl Grey tea. A golden english pale ale. Fruity hops with a citrus zest. A rounded bittersweet malt taste is complimented by a rich fruity aftertaste. The late hopping of Admiral hops leads to a refreshing bitter finish. A pale yellow coloured ale brewed with the Polish Marykna hop. The beer is then infused with fresh raspberries to give a gentle flavour. A black old ale with full flavour made from 5 different malts. This black bitter owes its characteristics to the large amount of chocolate malt giving it a velvety smooth rich coffee finish. No aroma hops are added, instead seven types of grain are used to develop the flavour. Light, with grainy citrus & marmalade flavours. This delightfully drinkable Wheat Beer is enjoyed by men and women alike. Now brewed with Citra Hops! Amber ale with loads of American hops and then dry hopped with even more. A rich full porter using four types of malt and two English hops gives chocolate and coffee flavours. Horsforth is a new nano brewery and we are proud to be featuring their first commercially available beer. Lost Dog uses citra hops and is a well rounded single hopped IPA. A pale ale that showcases the New 'Olicana' Hop, an English hop with a modern fruity flavour. Fresh and zingy, there are grapefruit notes and a soft yet crisp finish. A carefully selected blend of maris otter and roasted barley. Brewed with four choice hops; Target, Hercules, Nugget and Galena, producing a truly hoppy finish. A rich creamy stout, with a long lingering liquorice and pale chocolate finish. Warm aromas of the roasted, flaked and pale malted barley underpin the smooth richness of this stout, balanced by the pairing of Challenger and Target hops for a bitter finish. The combination of Fuggles and Northern Brewer Hops with blended pale and crystal malted barley produces an ale with a dry bitter character and tangy core. A golden coloured ale brewed with the finest Maris Otter extra pale malted barley blended with English and Slovenian Goldings hops offering a distinct floral mouth and nose feel. A ruby red beer brewed with a selection of Maris tter, Crystal and Black malts, combined with a blend of English and European hops that add a wonderful sweetness to this malty beer. Auburn/chestnut colour, well balanced between crisp biscuity maltiness and a citrus and fruit hop character with a hint of bitterness in the finish. A straw coloured pale ale with a pure malty body and a smack of refreshing hops. The combination of pale Maris Otter malts and choice German hops may make you pause for thought. The gentle biscuit malts, fresh Hersbruker hops seduce the taste-buds educating and enlightening the palate. Devilish dark ale with a treacle aroma and a smooth rounded taste. Maltiness is predominant throughout with some hops in the taste and bitterness coming through in the finish. American Pale Ale, boosted by the smoothness provided by the addition of Oats. Brewed with 100% New Zealand hops - Waimea, Rakau and Motueka - which add a soft fruit character, with Peach and Passion Fruit. This is a mid brown session ale with a complex malt sweetness that leads to a long hoppy finish. Golden bitter brewed with five different malts & five New World hops resulting in a complex depth of flavour leading to an aromatic resinous finish. A pale/blonde Easter beer brewed with pale malt and a touch of wheat. Moderately bittered with a clean finish derived from New Zealand 'Ella' hops. A pale beer with a hint of cherry. Smooth and very drinkable. A smooth deep brown porter brewed with a variety of coloured malts carefully balanced with Cascade hops. The exciting use of Malts, Roasted Barley and Hops, produce a truly unique beer with malt and hop characters but not excessively bitter. Tflavours are coffee, chocolate and hazelnuts with cocoa in the finish. A delicate blonde ale with floral notes, tempered with refreshing spicy finish. Pale amber in colour with a hint of roast character and a continental hop finish. A medium-brown traditional malty ale. Bitterness is moderate & English hops give a fruity / spicy hop aroma. A good session beer. Smooth and creamy with a distinctive hoppy aftertaste. A Light and refreshing Lager colour clear wheat beer flavoured with lemon grass & Lime leaves. Hopped with plenty of citrus hops to provide a thirst quenching pint. A stunning blonde beer, full bodied with a voluptuous aroma. It has a ripe generous fruitiness with deep and complex hop notes and a rich maltiness. A session beer; Maris Otter pale malt and Northdown hops. A very refreshing, medium bodied slightly bitter drink. Chocolate and Crystal malt combined to give a ruby red coloured beer with Fuggles and Styrian Goldings blended for a citrus flavour. Amber brown in colour, packed full of flavour and offers the perfect balance between bitter and sweet. A single hopped pale ale using Citra Hops. Citra is a US hop variety first released in 2007 that imparts interesting citrus and tropical fruit characters to beer. A light dry balance of grain and hops with a delicate finish and citric fruits. Unmistakable citrus notes from Cascade hops balanced with a floral aroma and crisp, dry finish make this straw coloured ale a fantastic session beer. An amber coloured best bitter with copious amounts of US Cascade hops. Wonderfully aromatic floral nose balanced by a gentle bitterness with a hint of sweetness. A Black India Pale Ale, or India Black Ale, where roasted coffee and chocolate notes meet hops, and more hops. Hopped with NZ hops to give us that gooseberry, grape flavour and crisp finish that we all know and love. Pale gold, Magellan is the ideal post-work pick me up. Pale gold in colour, Ro Sham Bo Session IPA smashes together a smooth, malty body with a tropical, juicy fruit aroma and flavour, leading to a bittersweet finish. Easy drinking for easy living. A traditional chestnut coloured Yorkshire Bitter made with a belnd of Malts infused with English hops. Subtle malt flavours give way to a floral spicey hoppiness to create a mild, bitter finish. A refreshing and full bodied sparkling golden ale, brewed using a blend of seven malts. Undertones of vanilla and fruit are offset by the citrus aroma of fresh hops, suggesting grapefruit and orange. Traditional Norfolk mild with a malty aroma and fruity undertones. Lightly hopped, this beer has a long clean finish. An initial crisp and clean floral flavour evolves into a hop-influenced citrus flavour with a slightly sweet malt background. The finish has a hoppy bitterness and a hint of grapefruit. A medium well rounded yet a little tart 4.6% cider – still mellow with a very slight tart finish. Made at Ampleforth Abbey in Yorkshire a strong, cider with a wonderful complex and a very fruity flavour. Traditional farmhouse medium sweet cider, with a fruity start and slightly sweet finish. It is naturally fermented and smooth tasting; a good 'all round' cider. Broadoak Bristol Port is a fruity colourful cider with a delicious apple taste and aroma. Moonshine is a crisp and clear cider with a very fruity flavour. A hazy dry cider a true west country traditional flavour with a bit of sparkle for the modern pallet light touch of old horse and a touch of astringency to finish as a dry cider should. A refreshing, delicate, medium-dry perry that has gentle pear tones and a crisp, dessert pear finish. Created with beautiful English Conference pears. A spicy mix of real cider, fresh ginger and tart raspberry...lovely and refreshing hot or cold. Pyder is the Original Pear Cider made from a blend of the best apples and pears grown in the county of Herefordshire. Blended and balanced to give the best taste of these two great fruits. This Welsh cider has a fruity apply aroma and a well balanced finish. A light and very easy to drink medium cider. This oak aged, Welsh perry is quite clear, has a caramel nose and a dry finish.It is a very lively. popular perry and easy to drink. Yarlington Mill is a single variety cider which has a crisp finish and a fruity balance. A pleasant easy drinking cider. A rich and fruity rustic cider bursting with apple flavour. Made from only freshly pressed apples grown locally in Somerset and then… just let the apples do their stuff! Infusing blackberries in a medium sweet cider gives it a nice maroon colour. This is a soft, medium cider with a clean flavour and a lingering apple finish. This cider has been fermented in old whiskey casks, initially dry with a sweet after taste. A beautiful Perry with a light sweet pear taste and nice crispiness. Lightly warming on the finish with faint spices and super sugary pears. Ripe red strawberries are juiced and blended with aged cask cider and a healthy squeeze of fresh lime. Delicate, sweet and naturally pink in colour, this cider is blessed with all of the charms of summer and a pleasing citrus kick. CAMRA national award winner in 2008. This medium dry cider is well rounded and fruity with a deep texture and flavour. It is a fantastic starting point for inexperienced cider drinkers as it is so very easy drinking. Rosie's Pig is an easy drinking cloudy cider with a fresh apple flavour with hints of citrus and spice.